Tuna salad plus crisp crackers and crunchy carrot sticks equals a savoury snack you can feel good about. Pack up this two-ingredient tuna salad and dippers for an on-the-go treat. Mix tuna with Miracle Whip; spoon into 2 airtight sandwich containers. Wrap crackers in 2 portions in plastic wrap; place 1 in each container next to tuna. Cover containers with lids. Pack 1 container in each of 2 insulated lunch bags. Add a plastic spoon and small resealable plastic bag filled with 5 carrot sticks to each bag. Serve with 1/2 cup cucumber slices, 1 Kraft aMOOza! Twists Cheese Snack and an apple. If preparing the night before, refrigerate until ready to pack in the lunch bag. 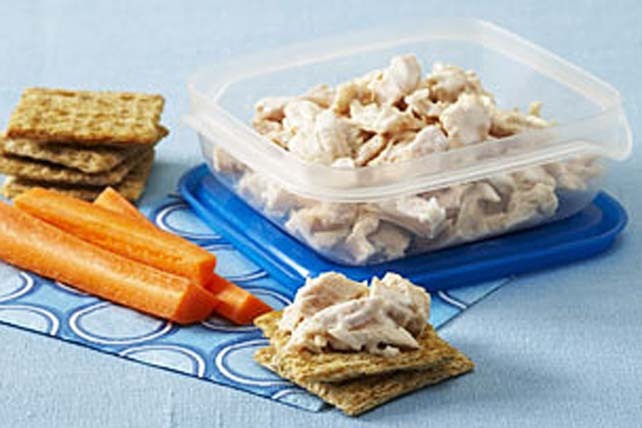 If you only need to pack 1 lunch, refrigerate the remaining tuna mixture for another use. The carrots in this tasty combination provide an excellent source of vitamin A.